Col. George Tromba, 412th Mission Support commander, cut the ceremonial ribbon to officially reopen the base theater at Edwards Air Force Base, Calif., as members of the 501st Legion looked on March 16, 2018. The Force is strong once again within the walls of the base theater at Edwards Air Force Base, Calif. The theater officially reopened for business March 16, 2018. 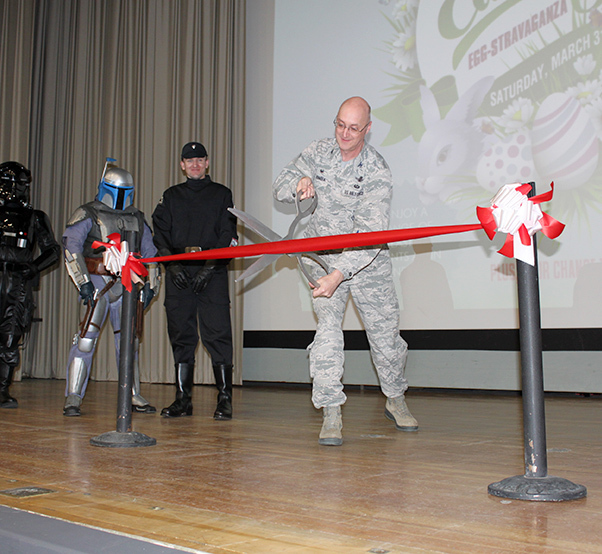 Col. George Tromba, 412th Mission Support commander, cut the ceremonial ribbon as members of the 501st Legion looked on. “Star Wars: The Last Jedi” was the featured movie for the evening. The theater had been closed for movie showings for several years. The interior of the theater has a new paint job and concessions are available for purchase. The theater is open to anyone with base access. The 412th MSG invited the 501st Legion to help with the grand reopening. According to their website, the legion is a volunteer organization for “Star Wars” costume enthusiasts who promote interest in the franchise through the building and wearing of quality, accurate costumes, and participating in community events. Movie show times can be found on the 412th Force Support Squadron website here: https://edwardsfss.com/wordpress/edwards-afb-theater. You can also visit the 412th FSS Facebook page at https://www.facebook.com/EdwardsFSS/.